Publisher synopsis: Ifemelu and Obinze are young and in love when they depart military-ruled Nigeria for the West. Beautiful, self-assured Ifemelu heads for America, where despite her academic success, she is forced to grapple with what it means to be black for the first time. Quiet, thoughtful Obinze had hoped to join her, but with post-9/11 America closed to him, he instead plunges into a dangerous, undocumented life in London. Fifteen years later, they reunite in a newly democratic Nigeria, and reignite their passion—for each other and for their homeland. I don’t think I’m being presumptuous here, but I came to know of Chimamanda Ngozi Adichie like many of you: Beyoncé. On her 2013 self-titled surprise album where Queen Bey decided to change the entire game, part of Adichie’s 2012 Ted Talk on on feminism breaks up the song “Flawless” (it opens with the super-hype and underrated song “Bow Down”). It was like all of a sudden, Adichie was a name I was supposed to know, so I looked her up and saw that she’d released several books, and at the time, her latest was Americanah. While she’s since fallen out of favor with many people because of her statements about transgender women (and her attempts to clarify them), this particular book spoke to my own life in a very direct way. At it’s core, it’s a love story about two people who separate and come back years later to see if who they are then can work. But for me, it is so much more interesting because of the “Americanization” angle that it presents regarding the main character, Ifemelu, who moves to the United States from Nigeria and basically becomes “Americanized” in her words, politics and mentality, especially about “blackness.” I say this because my wife is Ghanaian and we’ve had many discussions in our house, with her family and even with her childhood friends from Ghana about being “black” in America. We have had so many “cultural differences” debates, in fact, that the saying “your skinfolks ain’t always your kinfolks” takes on a whole new meaning. It’s not always, or even mostly negative, but the stark differences in the “black American” way of thinking versus the Ghanaian (but representing West African) way of thinking about American racism, blackness, how angry we are, how sensitive we are, etc. reminds me that we may all be distant cousins, but the emphasis belongs on distant, not cousins. We are basically a podcast waiting to happen. Anyway, our life is what happens when the West African (my wife) stays in America. Americanah is what happens when she returns to Nigeria. 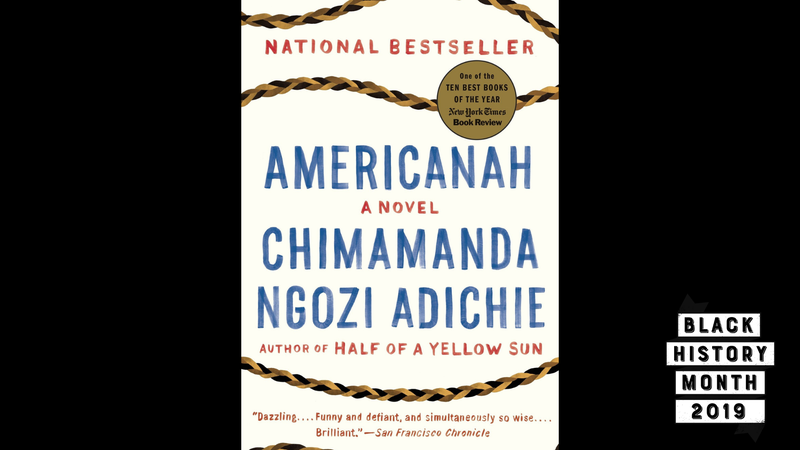 She basically gets called “Americanah,” and my wife has been told she’s Americanized enough for me to know how that goes. I think Adichie did a good job (at least from my perspective) of illustrating the struggles of an outsider coming to terms with American blackness and and then taking that newfound mentality home. I think we have a lot of healing to do as black Americans and black people of the diaspora before we can get to this truly diasporic dream many seem to adhere to. I think for book clubs that are interested in trans-Atlantic cultural exchanges, this is as good a book as you can get. And if you’re like me and half of your family is now African, it’s interesting insight into the other side. Of course, you could always just watch Nollywood movies, too. What Does Your Favorite Artist Have to Do to Lose Your Support? 10 Thoughts About Beyoncé&apos;s Remix of "Flawless"